The Parish Church of Pucking was built in the 12th century. In 1988 the whole building was renovated and reconstructed with love to the detail. In the church´s interior an infinite number of art treasures can be found, among them the precious statues of the Apostle Peter, the Archangels Michael and Paul, and many more. 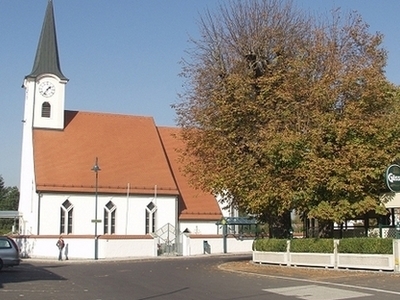 St. Michael´s church boasts many attractions. The outstanding oil paintings depicting the Stations of the Cross, in the main hall, are dating back to 1850 - 1875. A beautiful statue of Saint Sebastian, the Virgin with the Infant and Saint Rochus decorate the outstanding central area. The instrument expert Breinbauer renovated and enlarged the organ in 1858. Here's the our members favorite photos of "Churches in Traun". Upload your photo of St. Michael Parish Church Pucking!